Gretl Schlatter, her sister Heidi and her brother Brent, work with their father to milk 250 cows in Paulding County, Ohio. 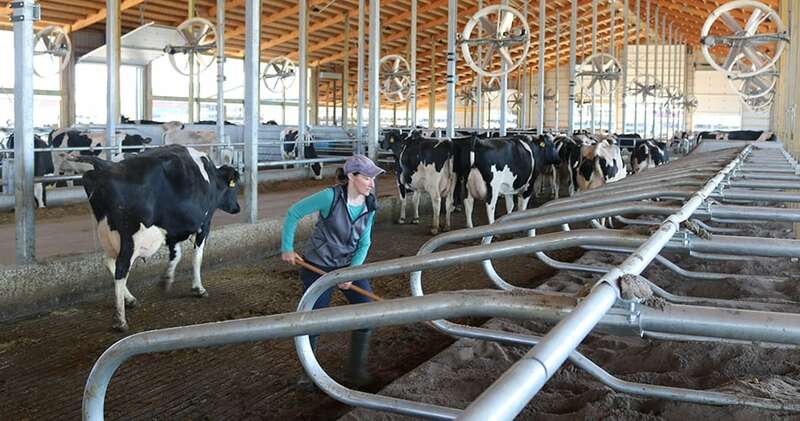 For the Schlatter family, cow care is everything. What’s are the best parts and the challenges of your job? Gretl: I always wanted to farm. I like the diversity and the variety in what we do. That’s what makes it interesting. As the seasons come and go, we have different focuses. In the spring, we focus on planting and all summer we’re making hay. In the fall we’re harvesting and in the winter we still have the cow’s to take care of. How does what a cow is fed contribute to high-quality milk? Gretl: Feeding the cows is very technical. We have a nutritionist who formulates their diets – it’s better than mine! If I would follow a nutritionist’s advice the way our cows have to, I would be in better shape. We primarily feed them corn silage and haylage and corn that we grow ourselves. We grow the feed for our cows, and we use the manure on those crops. Hear Ohio dairy farmer Gretl Schlatter respond to those who question if dairy farmers care about the environment. Does farm size matter? Do you care for your 250 cows differently than someone with 100 cows? Gretl: Definitely not. There’s the old saying “if you take care of the cows, they take care of you.” Cow comfort is huge. I don’t like using those terms “big farm, small farm” because we’re all farmers. We all love to take care of the cows, we’re not on opposite sides. We’re on the same team. Big farm, small farm, we’re all on the same team.